The Cab Calloway foundation had its kickoff with a gala event featuring Mrs. Cab "Nuffie" Calloway! The event took place on November 18, 1997. 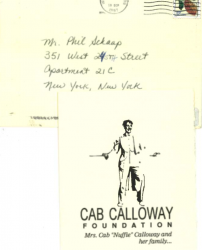 The invitation for the Cab Calloway Foundation event marks the ongoing influence of Cab Calloway's music and role as a cultural icon. Celebrate Cab and the Cab Calloway Foundation with the historic invitation.